Built Charleston, West Virginia by Ward in 1926 for the Ohio River Company, Cincinnati, Ohio and launched in July, 1926. Left Charleston with 4.8 ft. on the gauge. Her first trip out of the Ohio River was June, 1935 when she was sent to St. Louis for a barge of scrap consigned to Ashland, Kentucky. In 1936 she was taken to Dravo ways at Neville Island, Pennsylvania and lengthened. 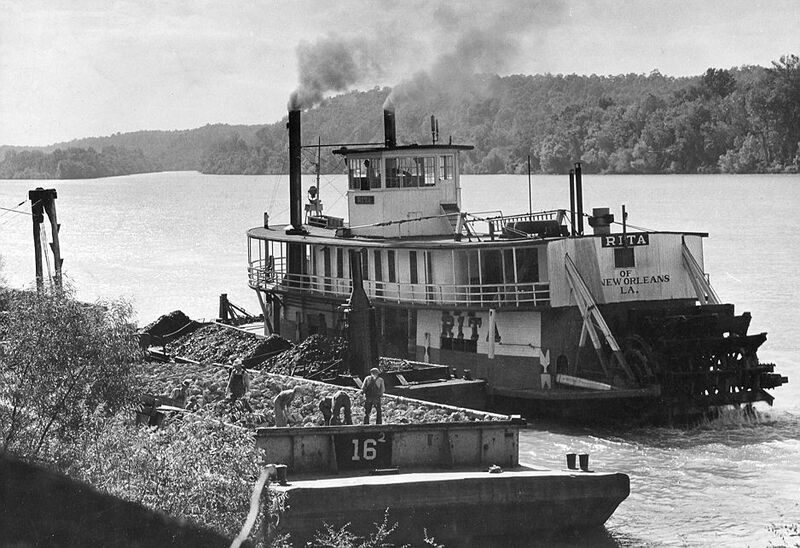 In the spring of 1937, she went to the Illinois River in the coal-towing trade. Later she was back in the Huntington-Cincinnati run under Captain George "Thuse" Hamilton as pilot then master. Latest real photo post card received today, there's no postmark or location on the back of the card. It dawned on me after looking at the contraptions that the crew of men on the barge are involved with that they could have been working on some sort of dredging operation to deepen shallow channels for navigation, and at the same time harvesting sand from the river bottom, possibly while the CARRIE V. was owned by the Parkersburg & Marietta Sand Co. beginning in 1906. Built at Antiquity, Ohio 1897; originally owned by the Varians at Point Pleasant, West Virginia. They apparently sold her to Cairo, Memphis and Southern Railroad in August 1901; in 1903 she was at Cairo, Illinois with Captain Fred Bennett, master. 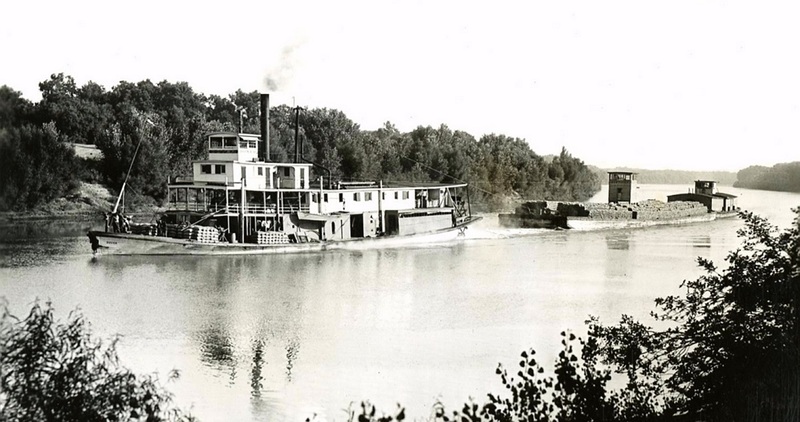 She was sold on August 10, 1906 to Parkersburg & Marietta Sand Company. On December 2, 1909 she sank at Bush's Mill, about three miles below old Lock 26, Ohio River, then in charge of Captain C. T. Dotson of Parkersburg; raised. Missouri Valley Bridge & Iron Company were reported to have bought her in July, 1911. Attached is a photo from one of 5 original 4 x 5 negatives that were taken for the following abridged 1955 Sunday supplement story published in the Des Moines, Iowa Register. 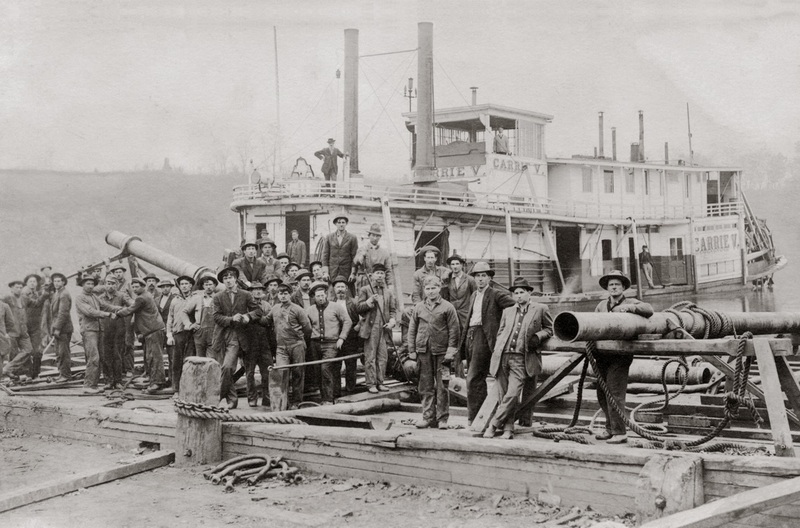 This image is the most interesting one of the group with the dramatic scaffold in the foreground framing the towboat KANSAS CITY and barges which were captured perfectly by the photographer while the boat was underway in the middle ground. I have concluded that past the end of the wooden wharf and scaffold was a barge secured at the shore at river's edge and the wharf itself appeared to be rigged like a castle drawbridge to be lowered into place for loading or unloading, depending on high and low water conditions on the river. The pile of rocks near the end of the barge was probably only a small percentage of the intended load of cargo. I have compared this image to a "scenic view" of the Missouri River on an undated colorized post card in which the scaffold in the foreground is very similar to the one in the Des Moines paper. The location was specified as having been taken "between Council Bluffs, Iowa and Omaha, Nebraska." It is probable that both images were photographed at the same location. When Cap't. J. H. Simpson is piloting the towboat KANSAS CITY , he has the latest in modern scientific devices to help him. On the translucent circular screen of the radar box, the shore, barges, buoys and other objects stand out white and luminous. Waterway supporters say 1,000 tons of steel shipped from Chicago to Omaha by barge saves 10,000 in transportation costs. Last year 5,000 tons of steel pipe were shipped by all water route from Houston, Tex, to Omaha at a saving said to have been 33,000. Other proportionate savings are also cited. On this trip up from Houston the KANSAS CITY was hauling 4,000 tons of molasses, and 25 tons of nails. Flat-bottomed, with as little draw as possible, the towboats and their barges skim along through water less than six feet deep. With the new dams going into operation in North and South Dakota, army engineers send down additional water in the dry seasons. But rainfall shortages upstream now hold these water releases to the minimum needed for barge line operation. History is beginning to repeat on the Missouri the story of success on the Mississippi. Last year about 62 million tons of freight moved through the Quad-cities, the fifteenth year since the Mississippi's nine-foot channel was completed. 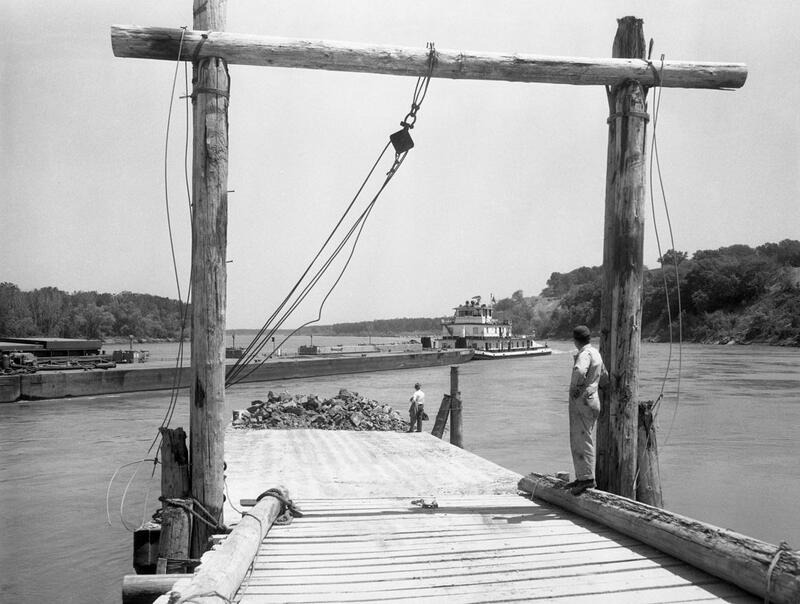 Back in 1933, the Mississippi tonnage was a half million below the amount expected on the Missouri this year. "Canal locks at Louisville, Kentucky." While owned by John Hoffman she was a harbor boat at Louisville, Kentucky. 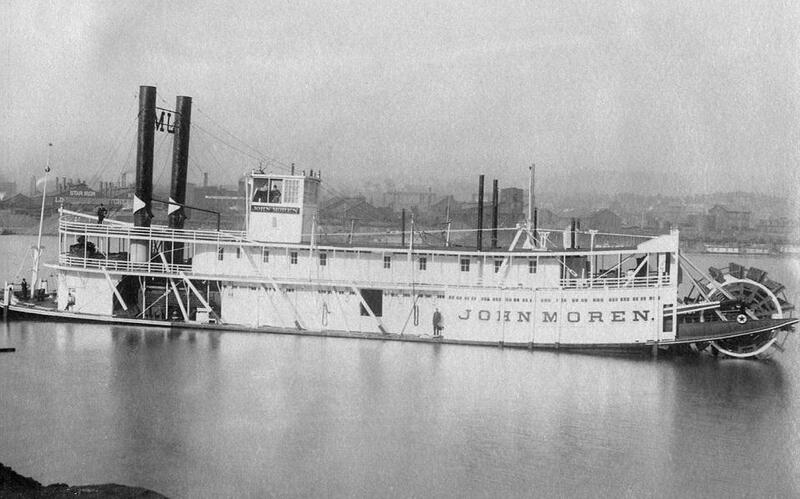 In April, 1901 she sank at the Louisville harbor while moored at shore with four loaded coalboats;one of the coalboats sank and pulled the other three and the Transit down. 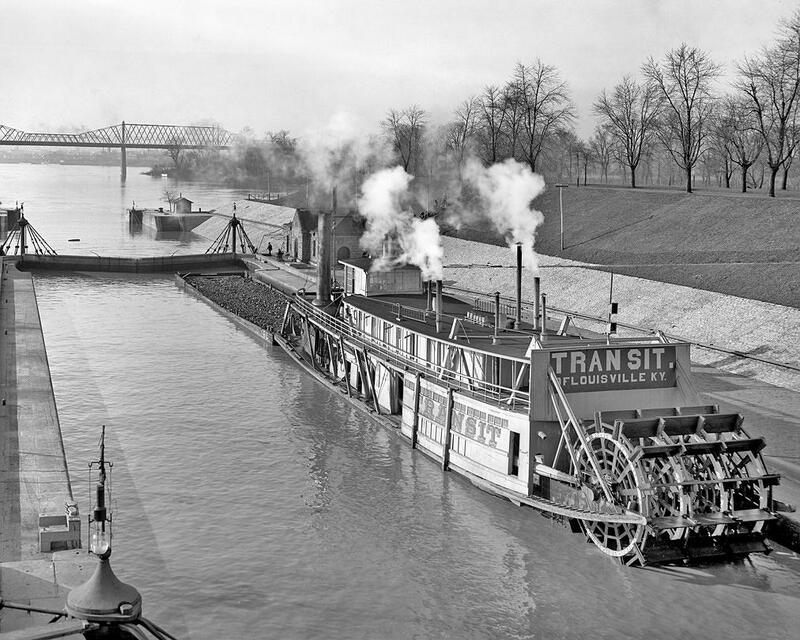 In March, 1912 Captain Dan Varble died on the Louisville levee enroute to catch the Transit. She was later owned by the Combine (MCC) and in March, 1918 they brought her to Pittsburgh.John F. Klein bought her in October, 1920. This 1928 photo was online a while back on the California state capitol's newspaper the Sacramento BEE. The DOVER No. 2 (1891-1935) was built in a characteristic style once plentiful on the Sacramento River. Boats like this appeared in that 1931 "talkie" HEAVEN ON EARTH that was based on Burman's novel MISSISSIPPI. The DOVER is literally "towing" two barges behind her, each barge was steered by pilots in the individual pilot houses which were necessary to keep the barges on the same course as the DOVER. In the Mississippi valley the barges are attached to the front end of the towboats and become in effect part of the towboat steered by the pilot all day and night, visibility permitting. 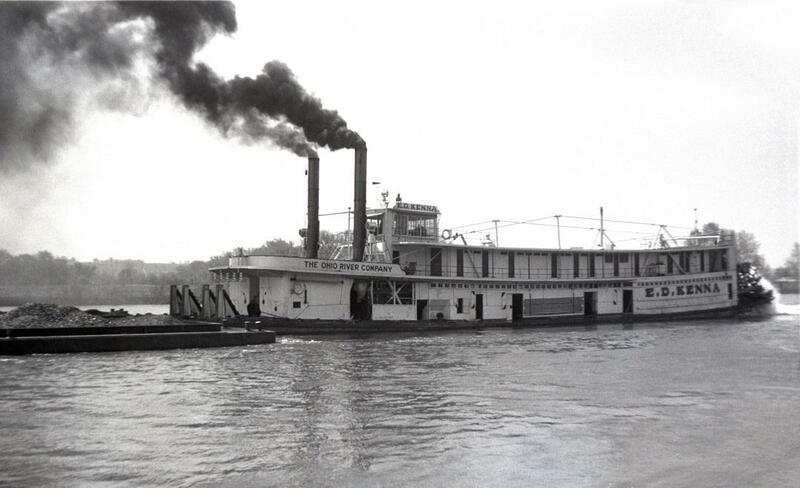 Madison Coal & Supply Company chairman Charles T. Jones took his family on summer vacations aboard the diesel sternwheel towboat LAURA J (built in 1929). 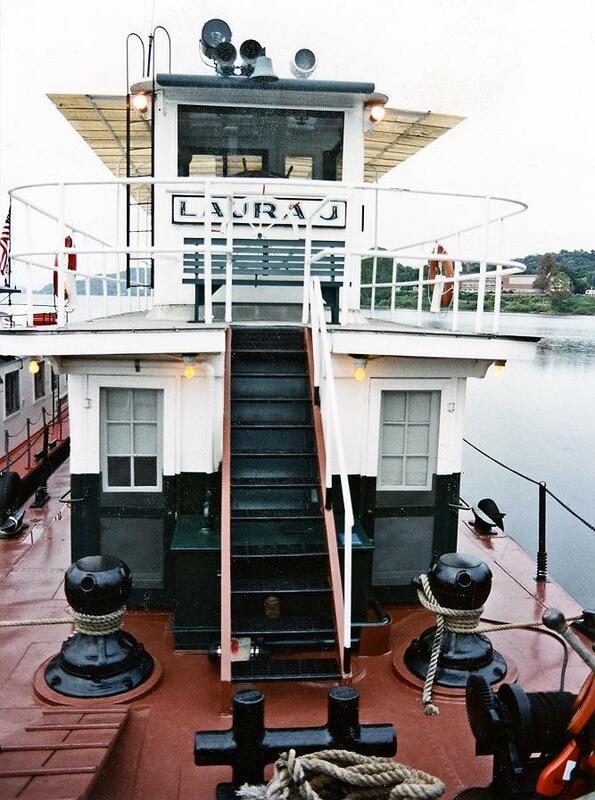 In a 2013 on portky.com Captain Eric Grubb wrote that the LAURA J. had been purchased by Lawson Hamilton who named her MOMMA JEANNE and keeps her at Port Amherst, West Virginia on the Kanawha River. 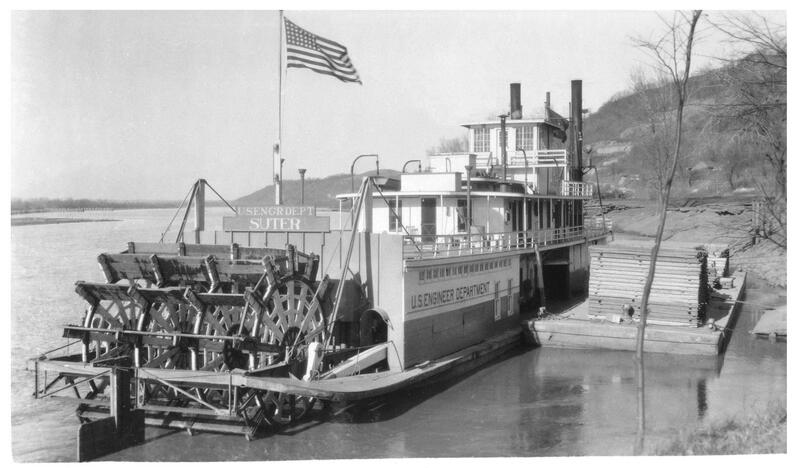 In one of the photos that Cap't Grubb posted of the MOMMA JEANNE in that article everything but the sternwheel had been remodeled so extensively that the boat no longer possessed the authentic vintage appearance that the LAURA J did. This print that I scanned was mixed in with some photos from my '93 DELTA QUEEN voyage that began at Memphis. I may have taken this after disembarking from the DELTA QUEEN at Cincinnati and took a rental car up along the Ohio River. This could have been taken at Aberdeen, Ohio (across the river from Maysville, Kentucky), Gallipolis, Ohio or Marietta, Ohio. The opposite shore reminds me of what I could see across the river from Gallipolis while taking photos of the JUANITA there in 1990. From a good quality poster print. 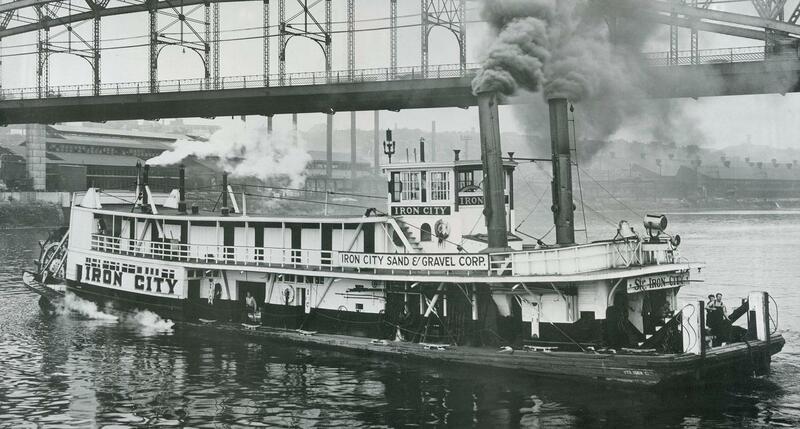 Our hero Fred Way Jr. was one of the two pilots on this towboat in 1935, In the winter of 1919 the IRON CITY was chartered to a movie company for NORTHWARD MALICE, filmed along the Allegheny River. So far I have not found any additional information regarding this "silent movie." The name may have been changed and some of the footage of the IRON CITY may have been "recycled" for use in "talkies" filmed after the advent of sound beginning in 1929. In December 1926 she was stranded for a time on Deadman's Island on the Ohio River. In the winter of 1919, she was chartered to a movie company for making the film "Northward Malice" along the Allegheny River. In August 1934 she burned to water's edge and was completely rebuilt. In November 1935, she made a trip for the American Barge Line. Dismantled in 1948 by the owners, the Crain Brothers. A favorite photo of a jaunty little boat. One of those perfect profiles with a beautiful reflection on the water. This is a craft one could live aboard and navigate the rivers with for a lifetime. "Was used as the bow boat for the Chancy Lamb when towing log rafts; did raft work in early years." This is an original albumen print that I loaned to Ralph DuPae and he had it copied for the Murphy collection. A Culver picture captioned on back "Loading rock phosphate." She left Morgan City, Louisiana on January 20, 1928 for Sheffield, Alabama under a contract to Tennessee Valley Sand and Gravel and was purchased by that firm. 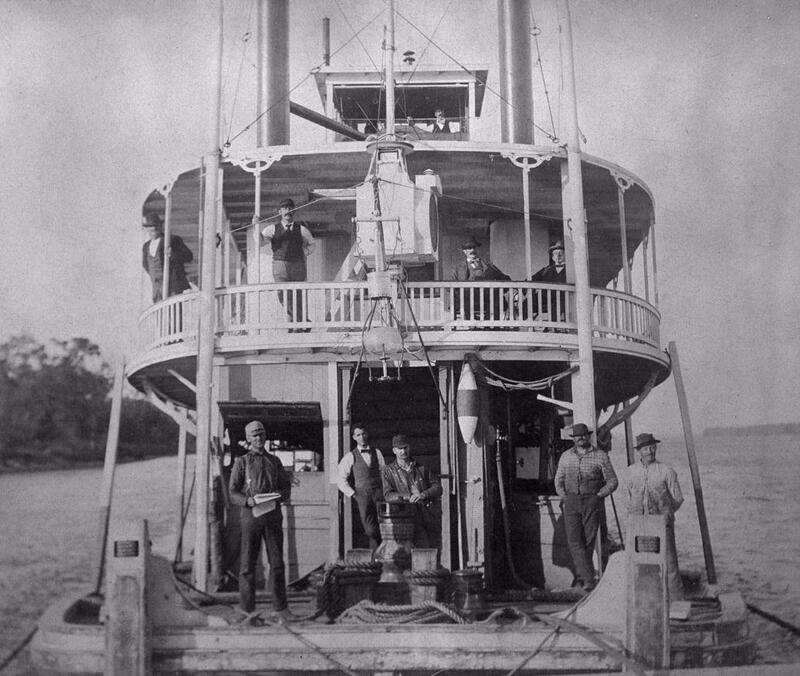 Sternwheel "pool style" Towboat in the manner of the W.P. SNYDER JR. Built at Ambridge, Pennsylvania by American Bridge Company, 1922, as the WM. G. CLYDE. Ran on the Ohio and Monongahela rivers. 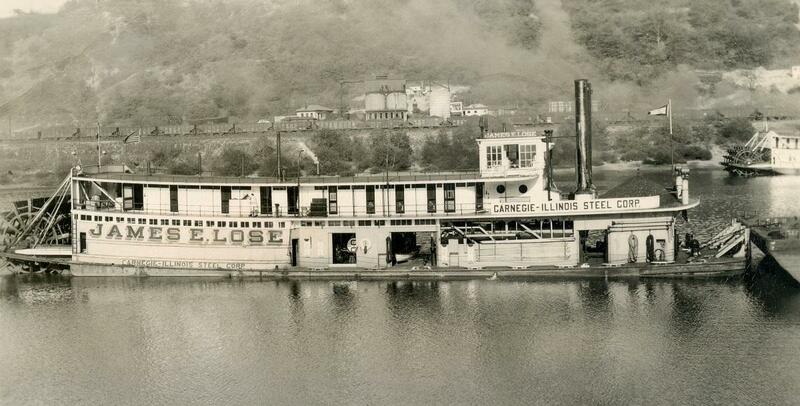 Renamed JAMES E. LOSE in 1937 after being purchased by the Carnegie-Illinois Steel Company, Pittsburgh. Renamed CHARLES R. COX in 1948. 2.30 X 4.15 snapshot of the SUTER on the Missouri River near St. Joseph, MO. Stw tb sh 1928-1952. b. Gasconade, MO, 159x30x5. Condensing engines 12's,24's-6 ft. stroke by Shelton. Water- tube boiler, oil burner. Owned by USE and a sister boat to BIXBY. Capt. Robert H. Wilson was master for some time on the Missouri River, Charles Weiher, chief engineer. Sold at public sale to Capt. I W. Menke, St. Louis, February 7, 1952 for $8,307.77. 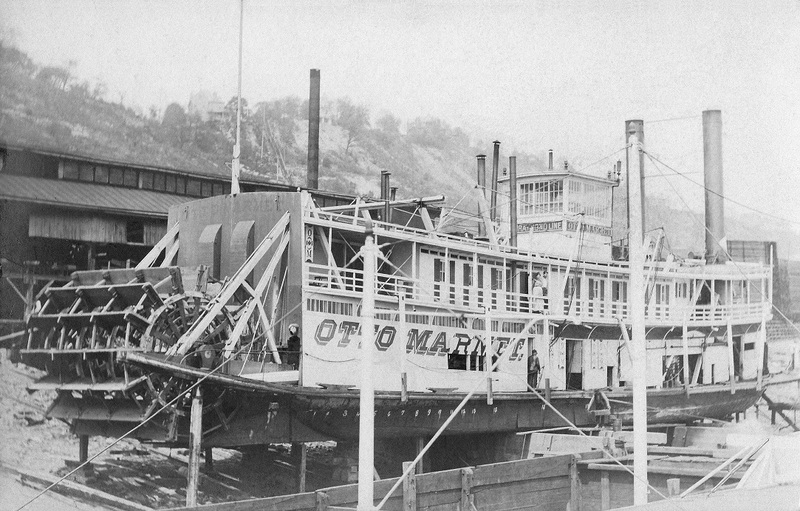 He renamed her CHAPERON and moored her with his showboat GOLDENROD at St. Louis. 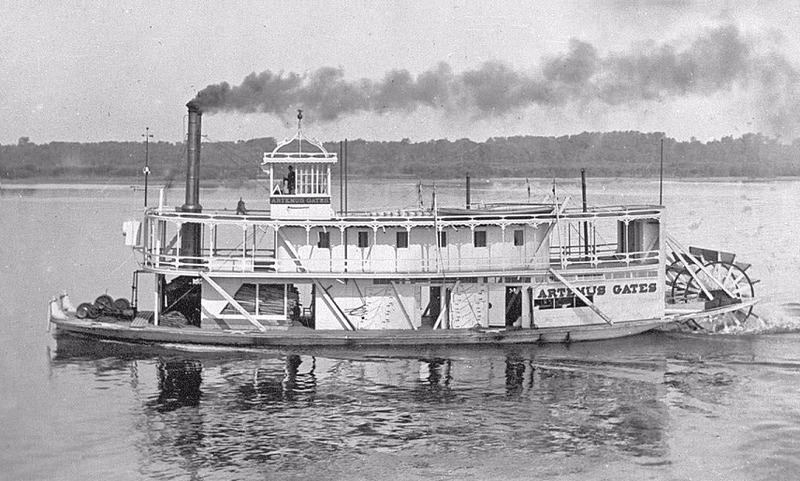 The CHAPERON was non-operating except to supply steam and electrical power for the showboat.